But first, why Knockout? Is it still even a thing? It just so happened that this question built on a comment from Steve Sanderson to me when he showed how to use databinding in Blazor to avoid having to deal with the DOM directly. And it all got me to thinking that perhaps its about time that I should explore alternatives to using jQuery solely to update parts of pages. As it happens, I have a large ASP.NET Web Pages LOB application (written in VB, would you believe?) that needs to be rewritten from the ground up. I have no interest in converting thie whole thing into a Single Page Application, so full SPA frameworks (which I would have to learn) are not required, but I could use an SPA approach to specific features, similar to the one demonstrated in the Knockout tuorial. I am happy using Razor Pages routing to navigate between features and to use server-side code to render as much of the initial state as possible. All I really need is a client-side framework that will help keep views in sync with the current state of their underlying model. There are plenty of choices for this, but Knockout is mature, stable, and pretty much all the questions about its use have been asked and answered somewhere, just a Google search away. I've written about using Knockout a couple of times in the past, so I have a reasonable idea how it works. This was missing in my case and a full repair to my Visual Studio installation was needed. Error	TS18003	No inputs were found in config file 'PathTo/tsconfig.json'. Specified 'include' paths were '["**/*"]' and 'exclude' paths were '["node_modules"]'. 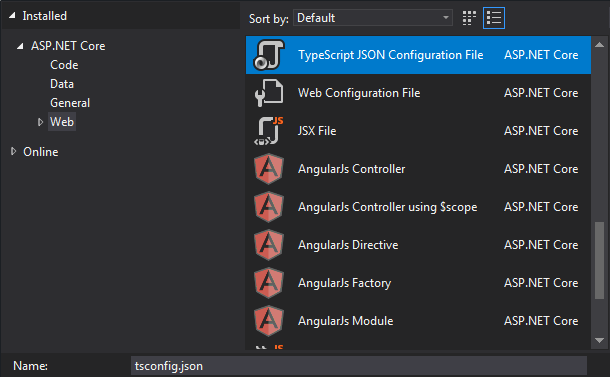 If there are no TypeScript files in the locations specified in the tsconfig.json file (which is everywhere in the project when no include paths are specified), the compiler returns the error above. To prevent this error, you just need to add an empty .ts file to the project somewhere. If you want to follow this article along, simply add a file named webmail.ts to wwwroot/js. Because you have nodejs installed, you can use its package manager to install Knockout. There are countless other options for obtaining external libraries, some of which I may explore at a later date - if they haven't already gone out of fashion. The command for installing Knockout using the node package manager is npm install knockout. If you are using Visual Studio, you can execute this command from the Package Manager Console. Otherwise you can use the Terminal in VS Code. In both cases, a node_modules folder will be created. Visual Studio will create the folder in the solution folder, i.e. one level up from the project. VS Code will create in the node_modules folder in the location that the command is executed - usually the root of the project. Either way, you will want to copy the knockout-latest.js file from the download (node_modules/knockout/build/output) into your wwwroot folder. I create a folder structure that follows those for existing third party libraries: wwwroot/lib/knockout/dist/ and place the knockout file there, renaming it to knockout.js. Declaration files are available from https://github.com/DefinitelyTyped/DefinitelyTyped where there are thousands of them for all sorts of libraries. That makes it kind of difficult to locate the one that you are interested in to get its installation command, but Microsoft have developed a search engine for declaration files here: https://microsoft.github.io/TypeSearch/. The command for installing Knockout is npm install --save @types/knockout. This will create a new folder in node_modules called @types. Inside that, you will find a folder for Knockout containing an index.d.ts file. It doesn't matter whether this is located in the project folder or the soution folder. 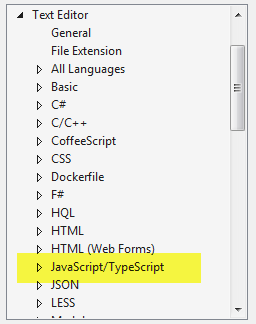 The TypeScript compiler will find it. You should avoid any temptation to create a copy of this file anywhere else in the project. If you do, the compiler will generate a number of "duplicate identifier" errors, not knowing which version of the declarations to use. When you create your Knockout ViewModel code in TypeScript, you will create a module. It will have a dependency on Knockout. At runtime, something needs to be able to resolve and load the dependency - a Module Loader. The recommended module loader for use in web applications is RequireJS. You can install this using the npm command: npm install requirejs. Once installed, you may need to move a copy of the require.js file to a location that's accessible to browsing. To keep things consistent in relation to third party script libraries, I copy it to wwwroot/lib/requirejs/dist/. Now that the configuration and setup is complete, it's time to code. The end result of code will take you to the third stage in the Single Page Application tutorial on the Knockout site. At this point, you will have a web mail application that displays a lsit of mail by folder, and enables you to view the details of individual emails. The mail will come from a service. So to begin with, you need some data. I borrowed the data from the Knockout tutorial site. You can get it here. Create a folder named Data in the application and store the content of the Gist as webmail.json in it. I won't go into too much detail about how Knockout works. That isn't the focus of this article. But the code declares a ViewModel with some properties representing the mailbox folders, the currently selected folder and the currently selected email message. The goToFolder function enables the user to move from one folder to another, and the contents of the folder are obtained using the jQuery AJAX get method from a server-side service. 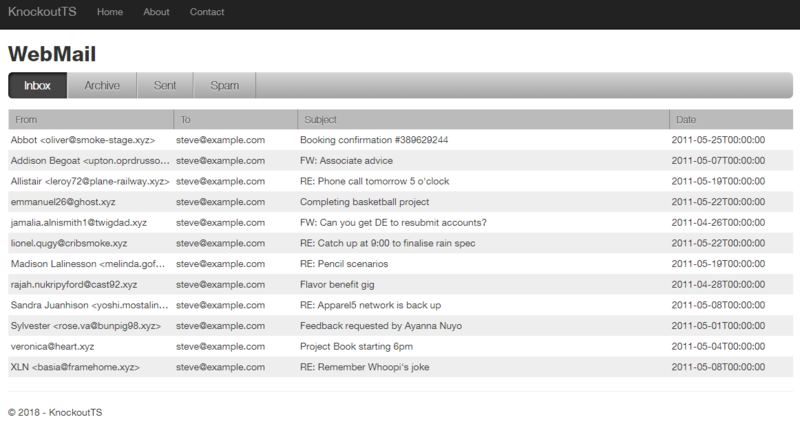 The goToMail function uses the same technology to obtain the selected message from the mail service. The firing of these methods is controlled by declarative bindings to click events in the UI. Data is bound to the UI using similar bindings. The full code for the application is available at this github repo. In truth, the UI used for this demonstration could have been a plain HTML file. There is no real use of Razor in it. However, I could have made the arry of mail folders part of a Razor PageModel, along with the content of the inbox which forms the default view and rendered that on the server, which would speed the initial page load time. Ultimately however, I am hoping that the Blazor experiment becomes an official thing from Microsoft. Then I will be able to just use C# for client-side development.